Barcelona Open Banco Sabadell, formerly known as Trofeo Conde de Godo, an ATP World Tour 500, is one of the most important clay tournaments of the season and features top ATP players as they prepare for upcoming Roland Garros. The tournament has been played since 1953 at the oldest and most prestigious Spanish tennis club – Real Club de Tenis Barcelona (Est. 1899). Accompanied with the annual conference on sports management, today, Barcelona Open is considered to be a one of the main social and sport events of the city. 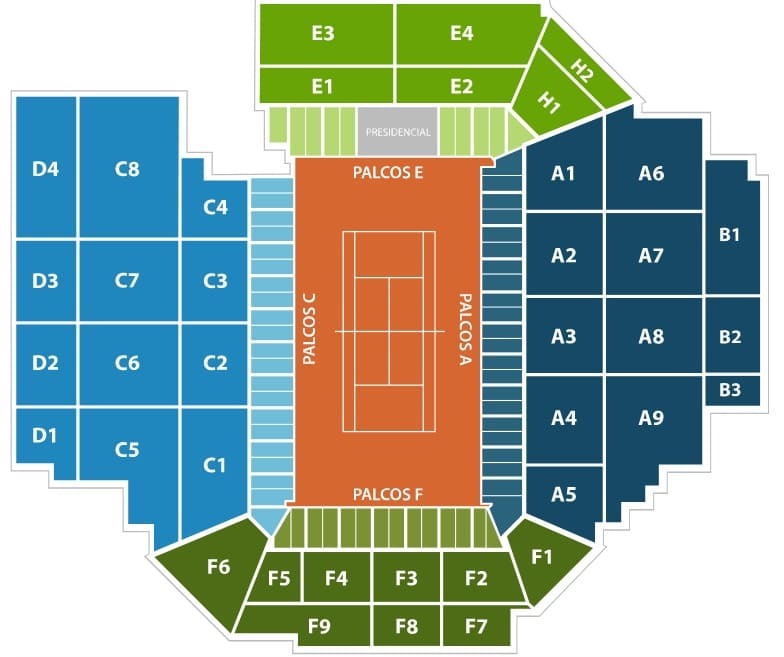 Ticket Resellers – Our recommended reseller sites for the Barcelona Open include StubHub (great selection and transparent pricing) and Viagogo. 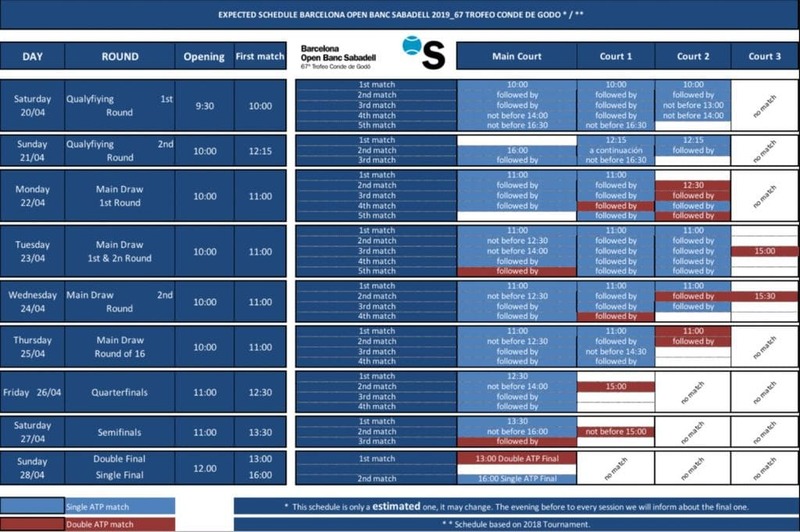 Direct Website offers primary tickets: barcelonaopenbancsabadell.com. Your ticket serves for the whole day, meaning you can watch every match that day, morning and evening sessions, no matter if on the Center Court or Court No. 1. Are you looking to maximize your time at Barcelona Open Banco Sabadell by avoiding traffic and being able to stop at your room between the matches or just run over when your favorite player steps on the court? Then make sure to stay close to Real Club de Tenis Barcelona 1899. There are so many hotels situated just minutes from the site! If you are looking for chic décor, free wifi, available parking, or if you like to drink your coffee the first thing in the morning, then Barcelona VIP Apartments are a great choice. They provide visitors with relaxing gardens and terraces, and breathtaking views of Barcelona. In addition, don’t forget to celebrate victories of your favorite tennis stars at the pool barbecue area! Looking for a beautiful and stylish lifestyle hotel? Then book a room in one of the AC Hotel Victoria Suites by Marriott, and experience a peaceful environment (due to its location), high quality restaurant, large-terrace bar, and more! If you would like to copy your favorite athletes and don’t mind a little exercise when going to watch the matches, then stay at Aparthotel Atenea Barcelona. Located only 0.8mile from the tournament site, this 4-star elegant apartment style hotel is just lovely. There’s a hotel restaurant serving homemade buffet breakfast, healthy lunches, and dinners. Also, guests are welcome to relax at the hotel lounge bar where they can order Cava. Definitely, one of our top pics! If you prefer to stay in guests’ favorite part of Barcelona with dozens of food choices, monuments, famous landmarks and museums, chose Downtown Barcelona. Depending on what type and category are you looking for, Barcelona City Centre provides visitors with diverse options for accommodations ranging from B&B’s, apartments, vacation rentals, to both boutique and luxurious hotels. If you are looking for an indulgent property with elegant design, friendly and professional staff, panoramic rooftop pool and a sundeck with astonishing views, pick The One Barcelona GL. In addition to the already mentioned perks, this hotel features the Somni Restaurant & Cocktail Bar where you may enjoy traditional Spanish tapas, and the Despacio Spa to recharge your batteries after long days of sightseeing, shopping and watching tennis! On the other hand, if you prefer to make the most of your time in the city and are almost never in your hotel room, select Stay Together Barcelona Apartments. They feature large size rooms with balconies and are located just minutes from Raval district, one of the Barcelona’s centers of nightlife. Room Mate Pau Hotel is another hotel to keep an eye on when making your plan for Barcelona Open Banco Sabadell. Described as being modern and chic, having friendly and professional staff, the hotel is in a great location, just 2 minutes from bars, restaurants, and shops, 2 minutes from Las Ramblas and Passeig de Gracia, and 2 minutes from Barceloneta and its beach! More so, it is only 800 feet far from Catalunya Metro and FGC Train Station! You cannot go wrong with the Room Mate Pau Hotel! Travel time from Barcelona Airport (BCN) to Real Club de Tenis is approximately 15 minutes and fairly easy. 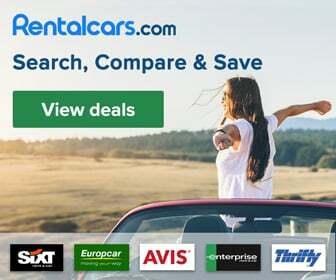 If you stay at any of our hotel picks near Real Club de Tenis (Carrer de Bosch i Gimpera, 5, 08034 Barcelona, Spain), expect to pay around $70 for a town car. Groundlink is one of the top worldwide car limo services, available at 100s of airports. Use promo code “RIDER” or “SAVEGL” for 10% off your next ride. Barcelona Airport (BCN) is about 15 minutes from Real Club de Tenis, and South of Barcelona City Center. There is sooo much to do in Barcelona, the cosmopolitan capital of Catalonia. Located in the north-east of Spain, the city is well known for its magnificent art and architecture, as well as it is considered to be one of the prime culinary destinations in the world. Don’t forget to visit Sagrada Familia, stop at the Museu Nacional d’Art de Catalunya, go to the show, enjoy wine sampling, and taste a variety of restaurants and “bares de tapas” in order to fully experience Barcelona’s culinary masterpiece. Get ready to watch long clay rallies, explore, learn, experience, and have a lot of fun!